This morning I had some time to catch up on the news and a few stories in the newspapers and online have caught my eye. Two fo them have to deal with the deal between Comcast and Time Warner Cable. The other story is running the numbers on buying a new car or a used car in terms of maintenance. We are currently Time Warner Cable customers, so we’re watching the news to see what is going to happen with Comcast. This Sunday the NY Time’s Farhad Manjoo did an analysis of Comcast’s current services and speculated on how future customers would be affected. Many families have dropped cable hoping to get big savings, but Comcast has priced their services so cord cutter aren’t really getting much of a discount. In fact, Manjoo found that it was just $10 more for a TV/Internet bundle that also included mobile service. 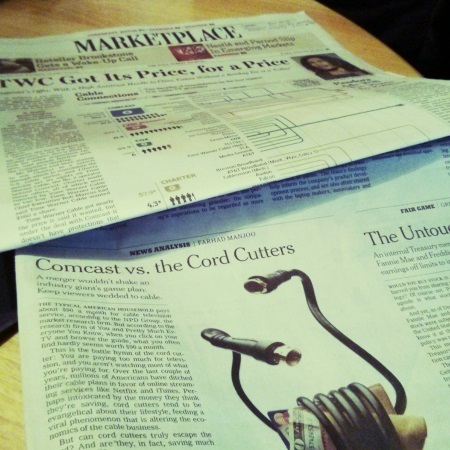 The Comcast deal is also on the news on the Wall Street Journal, with their story focused on the trade-off Time Warner Cable made to get the price they wanted. The deal is all stock and the price Time Warner’s CEO Rob Marcus wanted is $160/share. The WSJ goes into details about some protections that are NOT included with the deal, such as a consolation fee if the deal is rejected by the Federal Communications Commission and the Justice Department. Jacob from I Heart Budgets shares how buying a reliable used car will put you financially ahead by going over the typical life of a car for one owner from purchasing it the car to selling it off. He examines the idea that buying a high mileage car leads to more money on repairs. He looks at some scenarios and shares his take on what kind of car works in the long run. For us, we’ve found that buying our cars with no loans has made our monthly budget less stressful. After paying off our car loan years ago, we made it a goal to buy used cars (after thoroughly researching) and driving them until repairs are exceed savings or circumstances necessitate a different car. What money and personal finance stories are you following this week? How do you feel about the Comcast/Time Warner deal? What’s your take on buying cars – do you prefer new or used? Do you finance or buy with cash?